Winner TY-i30 is a multi-media player that can receive songs from mobile phones, IPAD and laptops via DLNA, AIRPLAY or Bluetooth. WIFI wireless audio transmission has AP mode (hotspot direct mode) and net mode (LAN Mode) 2 kinds of workers. 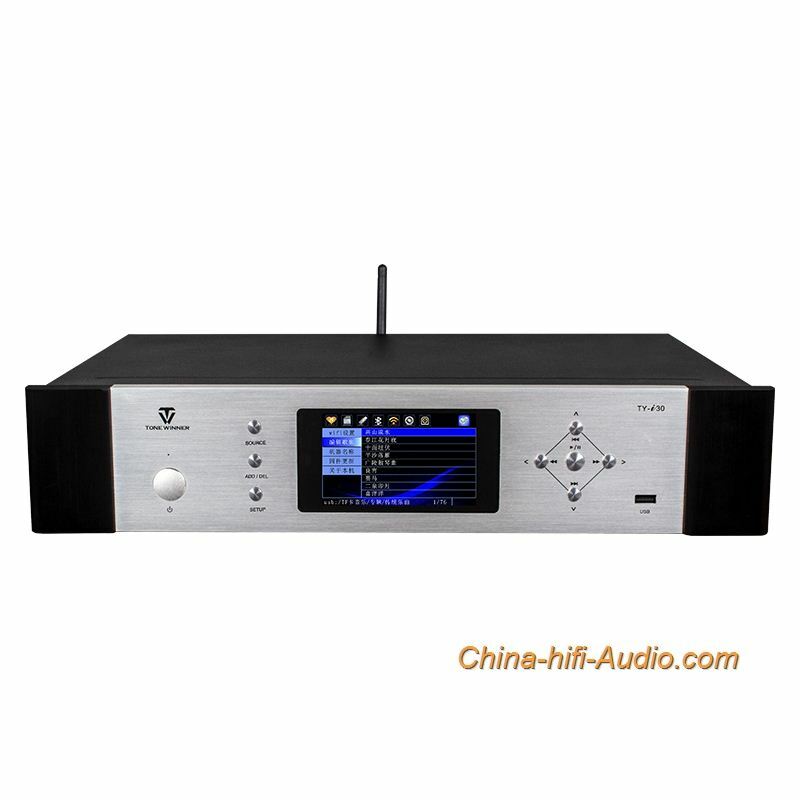 Winner TY-i30 also supports local playback of SD card and U disk, supports lossless music formats such as WAV, flac and APE, also supports MP3, WMA and other compressed music formats; supports fiber, coaxial 192KHz/24Bit PCM digital stream format input and Output. Winner TY-i30 decoding part of the material is very particular about, select a variety of high-end devices, digital audio receiver chip selected US Cirrus logic company's CS8416, support 192KHz/24Bit audio digital stream input; digital audio decoder chip selected the United States ADI chip AD1955 , Its signal to noise ratio is as high as 123dB; Operational amplifier selects American high-grade fever opamp OPA2134 of TI Company; This set of chip is used in the configuration that the high-end audio decoder predecesses the upper stage completely. For user convenience, TY-i30 uses a 4-inch LCD color display, the display effect is clear, delicate, complete display songs and storage path. The TY-i30 is designed in full compliance with enthusiast-grade products, hoping to meet the pursuit of the most demanding audiophiles for sound quality, and its sound performance is excellent. The treble is sweet and supple, the mid-range sounds warm, and the low frequencies are strong and powerful. The overall sound balance performance is excellent, accurate positioning, rich details, distinct layers, and the sound field is gorgeous and grand. The overall sound quality is beautiful and exquisite, full of musical expressiveness!